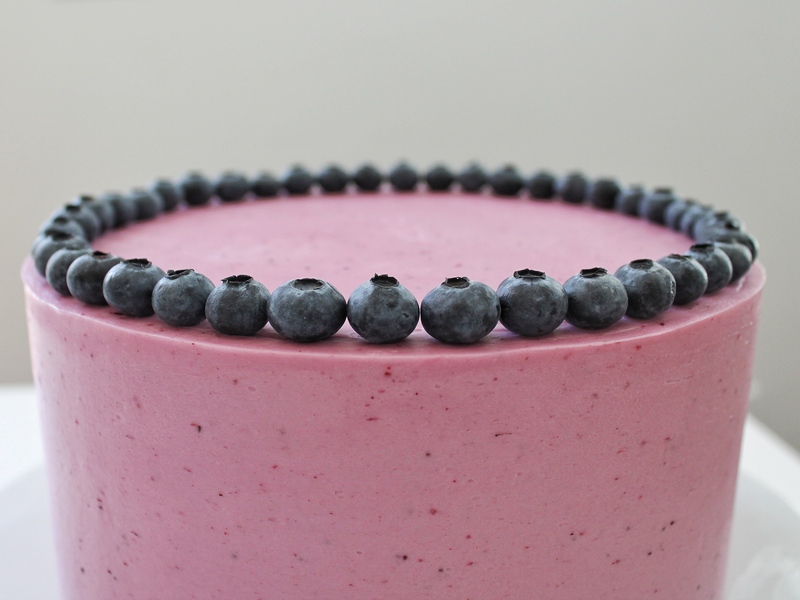 Tender gluten-free vanilla cake layers with mixed berry frosting and compote. 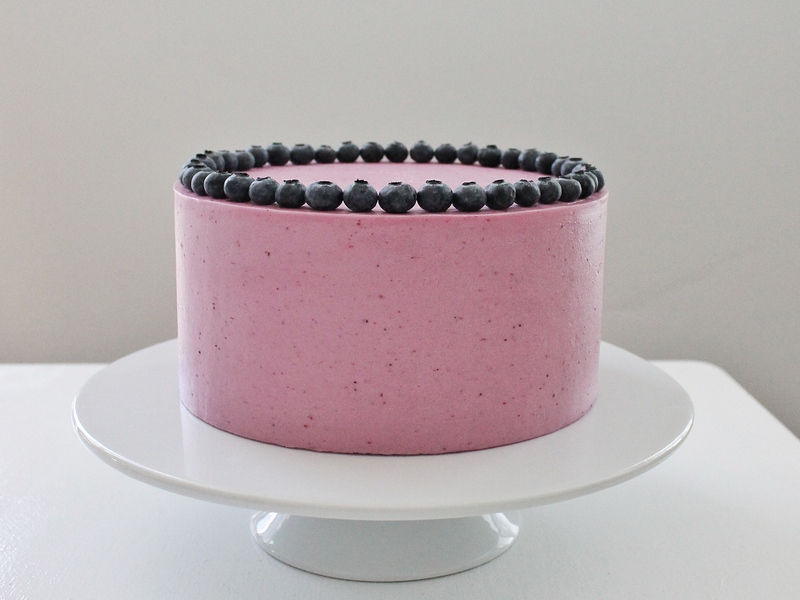 I’m so excited about this gluten-free vanilla cake with mixed berry frosting! I’ve had a lot of requests for gluten-free cake recipes. The only gluten-free recipe I have so far is my Gluten-Free Chocolate Cupcakes, which use quinoa instead of flour. Yup, you heard that right, quinoa! You have to try them before you knock them. The quinoa is cooked, blended, and totally disguised in a rich dark chocolate flavor. Up until those cupcakes, I had been fairly hesitant to bake anything gluten-free – mostly because I associated gluten-free with coconut flour based desserts, which are always so dry and bland. (Ugh, no thanks!). However, those cupcakes turned out SO good, I began to have high hopes for all gluten-free desserts. After the chocolate cupcakes, I began to experiment with gluten-free chocolate chip cookies. I tried a few recipes that didn’t hit the mark for me, but during my research discovered the brand Cup 4 Cup, which makes an all-purpose gluten-free flour. As I read reviews, I was excited to learn that it was apparently a great alternative to regular all-purpose flour. I was intrigued and tried it in some chocolate chip cookies. The result? Very impressive substitution, in my opinion! I had tried almond flour, coconut flour, and several other gluten-free alternatives and didn’t think any of them came close to the texture and flavor of good ol’ all-purpose flour. The next step was to try Cup 4 Cup in one of my cake recipes. With my Peach Crisp Cake being my latest obsession, I decided to use the vanilla cake from that recipe as the test run with Cup 4 Cup. I followed the recipe almost exactly, just substituting the Cup 4 Cup flour for my regular all-purpose flour. I made the cake exactly as if I was using all-purpose flour and found the batter to be just as flavorful and tasty as the regular version. The one difference I noticed was that the batter was somewhat sticky. I feared this meant the texture of the cake would be rubbery, but I was wrong. (Yay for being wrong sometimes!). The cake bakes beautifully and tastes delicious. 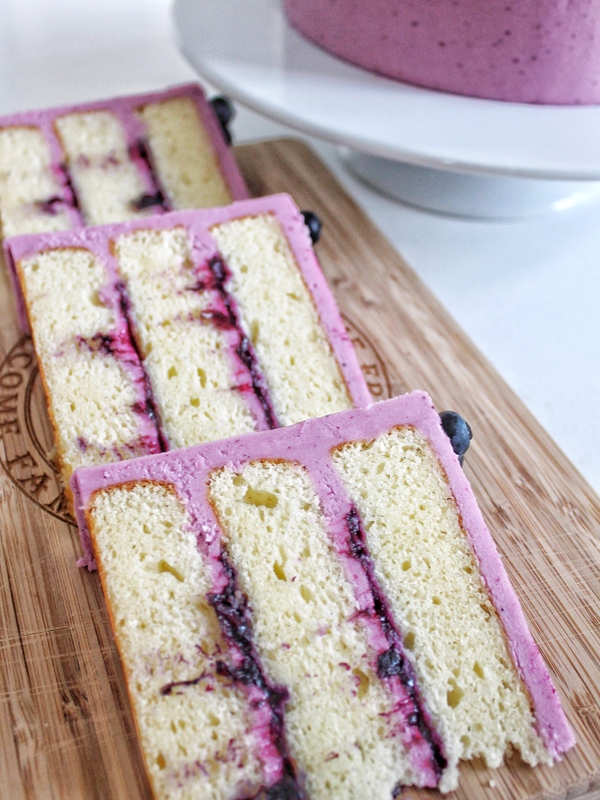 The layers are tender, moist and full of that wonderful vanilla bean flavor. As with any cake, you want to watch the baking time closely. For me, this cake was perfect at 23 minutes. I like to see a little crumb on my toothpick when I give it a poke. I’m always worried I’ve over-baked my cake if the toothpick comes out totally clean. You can also tell that your cake is about done baking when the edges of the cake start to pull away from the pan. Just remember that your cakes continue to bake for about 5 minutes while they cool in the pan. Having just made the peach filling for my Peach Crisp Cake, I stuck with fresh fruit for this cake as well. This time I made a mixed berry compote and used it for my filling and in my frosting. 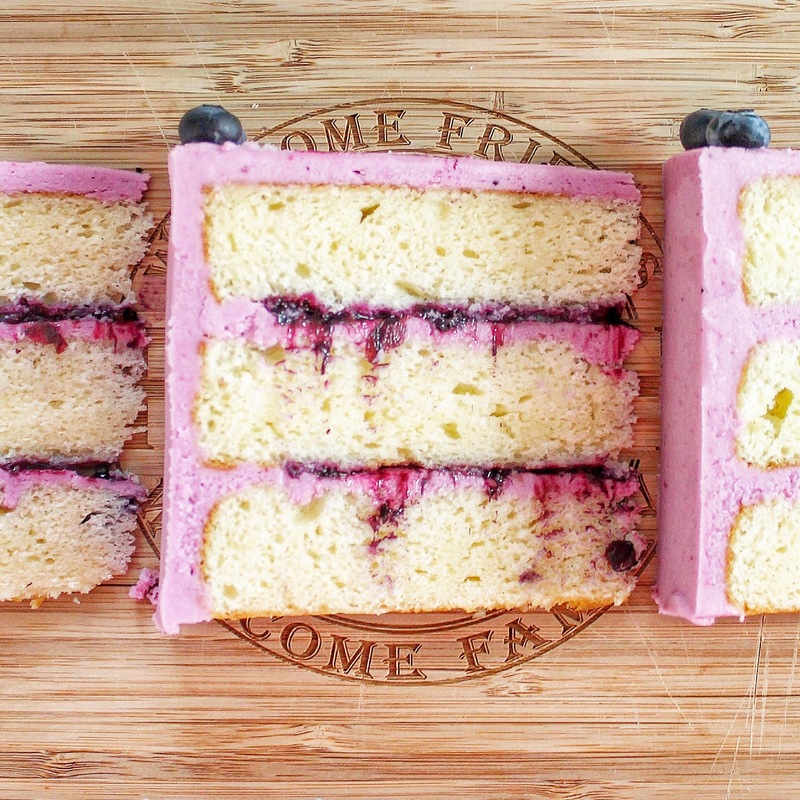 But don’t feel limited to pairing this cake with fruit. This vanilla cake would be just as yummy with a chocolate buttercream! Can’t wait to hear your reviews! Add the vanilla extract and vanilla paste. Mix on low until combined. Evenly distribute the cake batter in the three pans, about 16 to 17 ounces of batter in each pan. The cake batter will be sticky. Smooth it out with an offset icing spatula or back of a spoon. Bake the cakes for about 23 minutes, until a toothpick inserted in the center of the cakes comes out with only just a few crumbs on it. Combine the berries and sugar in a medium saucepan over medium heat. Stir the mixture while bringing it to a boil and occasionally breaking up the berries to release their juices. Let simmer for about 5 minutes. Add the cornstarch slurry and stir until combined. Bring to a boil and then simmer for another 5 minutes. Strain 1/3 cup of the mixture and reserve for frosting. Refrigerate the strained berry mixture and the remaining compote for at least 4 hours before using. With the mixer on low speed, slowly add the powdered sugar, followed by the mixed berry juice, heavy cream, vanilla extract and dash of salt. Before frosting your cake, mix the frosting by hand with a wooden spoon to push out the air pockets. This will also help the frosting pull back together if it looks separated from adding the berry juices. I really want to try this recipe, but I really need to know if is 3 or 4 Cups of the multi- purpose gluten free Flour. Please let me know. What is the correct amount of flour in the recipe. Love all your recipes and looking forward to trying this one! Nevermind my previous comment. I read your blog and realized it is the name of the flour! DUH!! I made this cake this morning, and it was fantastic! Everyone who ate it, said it was better than a regular cake! I used Bob’s Red Mill’s 1 to 1 flour blend, which worked perfectly. Thanks for the recipe! Is it 1/3 c. STRAINED mixed berry compote or is it 1/3 of the mixture and then strained? 1/3 cup of the juice of the strained mixture. The cakes shrank significantly. Is this normal? They were big and puffy in the pan and then as they cooled they got much smaller. Thanks! Hmmm, it shouldn’t shrink significantly… just a tad is ok, but more than that isn’t usual. I’ll have to think about why that might have happened. Did they sink in the middle at all or just deflate? I just made this for my bosses 30th birthday. It was a hit! So delicious!!! I also used Bobs 1 to 1. I unfortunately didn’t have vanilla bean paste but substituted 2 vanilla bean pods. Thank you so much for this recipe!!! Yay! So glad you liked it!!! I found you from the I Am Mom summit and really excited to find this recipe. I am an amateur cake decorator and always looking to learn more. I have made cakes for sevearl family and friends. Recently we discovered my daughter has a gulten and dairy allergy. Would this recipe work for ausbtituing out the butter and buttermilk for margerine and maybe almond milk. Thanks for your help. Hi! Welcome and thanks for watching my session! I haven’t tried those substitutions for this cake, so I couldn’t give you a confident answer either way. I’m sorry. I think it’s worth a try though! This looks amazing! I have a question for you though. My best friend is Gluten Free but she also can’t eat dairy. 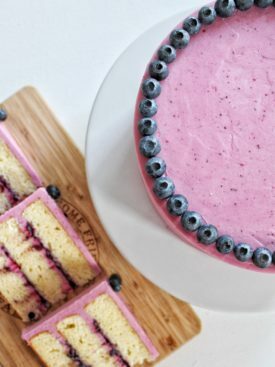 Do you have any ideas of how I could make some delicious cake like this without dairy? The frosting is always the hardest part! If anyone can figure this out it’s you! I would totally appreciate your help! I don’t have a good dairy free frosting yet. I need to play around with some alternatives to dairy. I’m hoping to work on dairy free and egg free cakes. Stay tuned! 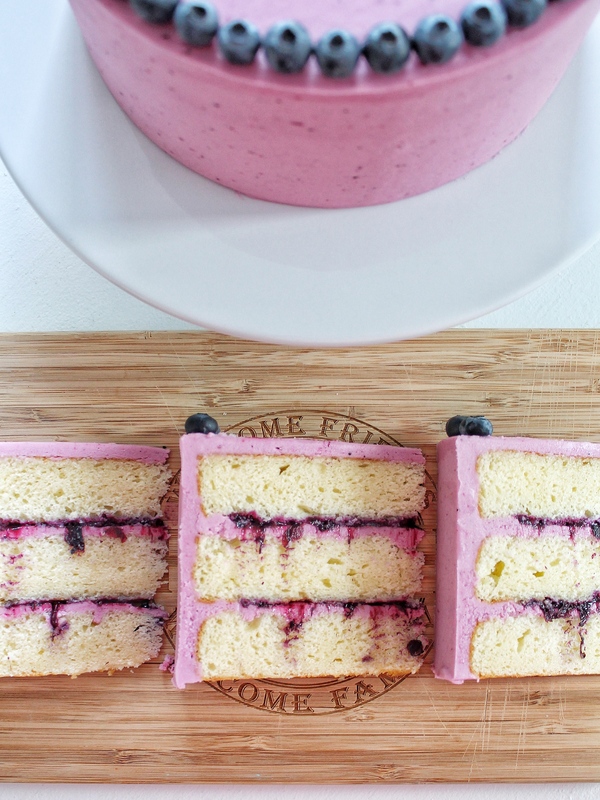 Most gorgeous cake I’ve ever seen…. wow. At which stores could you find the cup 4 cup flour and vanilla bean paste? Target carries Cup 4 Cup now, as well as Whole Foods and Good Earth. Where do you find the bean paste? We went to two different stores and called several others. None of them even knew what we were talking about! I guess I’ll make it without. Hopefully it’s still good! I bet it will taste great. I get mine at Orson Gygi, Harmons or even Michaels craft store! YUM! And thank you for a GF option! Can you tell me about using a compote with a cake and shelf life? If making a birthday cake ahead, will I need to wait to put the compote on the day of? The same if fruit is mixed in the buttercream? Yes it’s mixed in. You can add the compote early too. Hi Courtney, I only have two 20x7cm cake tins (almost 8x3in but not quite) – do you think I would need to buy a 3rd one or would the mixture work halved if I adjust the baking time? Also my oven is super small – do the cakes all need to be cooked together at the same time? Have you tried using 3*6” pans? Can you suggest a bake time for that? HAha no everyone will be ok. GF is a little tricky and does some weird stuff but if it didn’t sink, I think you’re good to go. It just shrinks a little.